Faith Christian Academy in Orlando Florida has deemed Vanessa VanDyke's hair a "distraction" and is asking her to cut it or face expulsion. 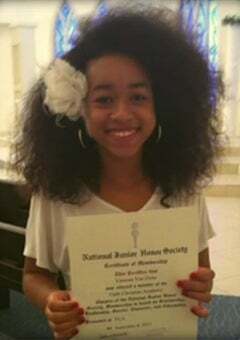 According to ClickOrlando, Vanessa VanDyke, 12, is facing expulsion after being bullied over her natural hair. Vanessa, who has worn her hair natural all year long, says it only became an issue once she complained about being teased. The academy has a dress code that states: “Hair must be a natural color and must not be a distraction,” and the examples of a distraction include but are not limited to, mohawks, shaved designs and rat tails. She was given one week to decide whether to cut her hair or leave the academy that she has attended since third grade. The family plans to stick to their decision to wear her hair naturally. “I’m depressed about leaving my friends and people that I’ve known for a while, but I’d rather have that than the principals and administrators picking on me and saying that I should change my hair,” Vanessa said. The academy’s administrators responded to an email about the issue, but did not provide any answers to questions.